During the last 2-3 decades, the southwest part of China has experienced increasing extreme events such as drought and floods that have caused significant economic losses. Climate change in particular has had a significant impact on runoff from glacier and seasonal snow melt in the headwater region of the Yangtze River basin, severely impacting water resources, and thus livelihoods, downstream. In recent years, the aquatic ecosystem of Jinsha River, a headwater system within the Yangtze River Basin, has also experienced significant changes due to the construction of hydropower stations. These changes are putting additional pressure on cold water fish species distributed in Jinsha River, which are already under pressure from the changing climate. To ensure the success of long-term development in the region, impacts of various factors - climate change, and rapid socio-economic and demographic development - on water resources and extreme events need to be understood and integrated into development planning. The Jinsha River Basin (JRB) project* is a Sino-Swiss cooperation aiming to foster integrated water resource management (IWRM), under the perspective of climate change and socio-economic and demographic development. The overall goal of the project is to improve livelihoods in the basin through future-oriented and sustainable river basin management. The project analyses the past and current water characteristics in JRB, elaborates climate change scenarios for temperature and precipitation and sets up socio-economic trends, such as population growth or standard of living, which might have an impact on future water resources management. Based on these findings, adaptation strategies and measures are developed supporting local and regional water management plans and considering short- and long-term challenges. After the joint planning mission in the fall of 2013 and one year's preparation, the JRB project was launched in March 2015, marking a new stage of the Sino-Swiss cooperation in the water domain under the Memorandum of Understanding signed between the two countries in year 2009. The project is overseen by the Chinese Ministry of Water Resources and the Swiss Agency for Development and Cooperation. It is implemented by the Changjiang Water Resources Commission (CWRC) and a range of Chinese academic institutions and government offices, in partnership with Swiss engineers and academic institutions. The names of all involved partners are given in the Booklet*. *Download the Jinsha River Basin (JRB) project Booklet from the right-hand column. The Jinsha River Basin (JRB) project Factsheets are available to download from the Further Resources section. The Jinsha River is the upstream of the Yangtze River, and stretches from the Qinghai-Tibetan plateau in the west to a lowland region in Sichuan Province at the Eastern edge of the Himalaya range. 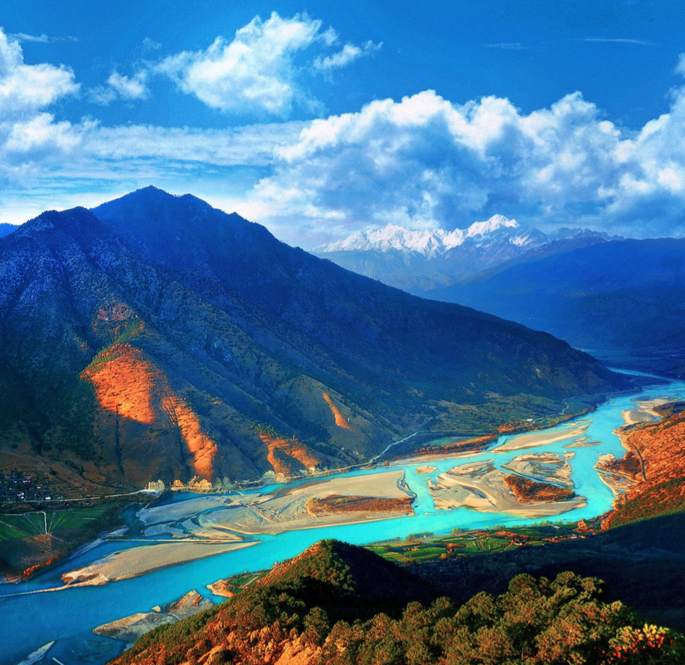 The River Basin covers an area of 540 000 km2 and crosses five provinces, namely, Qinghai, Yunnan, Sichuan, Guizhou and Tibet. Many Eurasian biological communities live in JRB, with more than 20% of advanced plants and 25% of animal species of China distributed in this region. The middle reach of Jinsha River passes from north to south through Lijiang, located in the mountainous northwest part of Yunnan Province. Lijiang has a subtropical climate influenced by the South Asia/ India monsoon. The old town of Lijiang has been recognized as a UNESCO World Heritage Site (UNESCO, 1997). Home to 27 ethnic groups, the ancient buildings and water veins have attracted tourists from all over the world. The continuous decline of the Yulong mountain Snowline over the past 30 years. The drying up of spring water from Heilongtan (Black Dragon pond), historically been the main water supply source for Lijiang old town, since 2012. Increased water demand due to socio-economic development. Develop and consolidate hydro-meteorological knowledge on water dynamics in JRB. Identify and further analyse the impacts of climate change on water resources and extreme events in JRB. Develop adaptation strategies and measures to address climate change impacts on water resources, including the development and assessment of flood control and drought relief risk management interventions, such as cascade reservoir operation and management. Develop an international platform for knowledge and expertise exchange on water resources management and climate change adaptation that discusses on going work and draws out lessons and understanding relevant to efforts to adapt to climate change elsewhere in the world is operating involving Swiss and Chinese experts. The project works in several distinct areas that are described in brief below; for more detail see the JRB Project Factsheets (available under Further Resources). Water-related natural hazard events can strongly influence water resource management and risk management. The occurrence, magnitude and consequences of such events, mainly the largest ones having biggest impact, thus have to be considered and understood. Literature and inventory review on water-related natural hazard events, data collection on historical disaster events. Elaboration of a standardized analytical framework to be able to make a quantitative description and classification of the characteristics. Analysis and evaluation of the registered events. Report to outline the analytical framework and provide information on extreme events. Glaciers and seasonal snow cover in the Jinsha River Basin (JRB) are important components of the water cycle. Therefore, the state and changes of glaciers and seasonal snow cover as well as their spatial distribution and temporal contribution/proportion to the water resources allocation in the JRB have to be investigated. Based on the analysis of the current monitoring network and the field investigations, an automatic terrestrial monitoring station was designed and installed. Time series of remote sensing imageries have been used to estimate the snow covered area. The Snow Runoff Model (SRM) is applied to simulated streamflow from snowmelt at the source of Yangtze River. In recent years, the aquatic ecosystem of Jinsha River has experienced significant changes due to the construction of hydropower stations. Further, cold water fish species which are mostly distributed in Jinsha River, will be increasingly under pressure due to climate change. This research provides an overview of the aquatic ecosystem of Jinsha River, with a special focus on the fish communities and habitats. Fish community similarities and fish assemblage structure were analyzed using cluster analysis and nonmetric multidimensional scaling based on field survey data (2012-2014). Habitat suitability curves were developed using the selected environmental factors based on the in-stream flow incremental methodology. The ecosystem health was assessed by the Integrity Biological Index (IBI). Scenarios describing expected climate change in JRB are of critical importance to understand how climate change affects the sustainable use of water resources and water-related extreme events such as floods and droughts. Multiple general circulation model (GCM) projections and two statistical downscaling methods (delta change and LARS weather generator) were used. A set of climate change scenarios were elaborated covering near future (and far future, and two green-house gas emission scenarios (RCP 4.5 and RCP 8.5). Each CC scenario consists of daily values over 30 years for average temperature and precipitation on a grid with a resolution of 0.5° covering JRB. Consider performance of GCMs for historical simulations, expected uncertainty and independence of GCMs to select suitable GCMs. Use of two statistical downscaling methods (delta change and LARS-WG) and the selected GCMs’ projection to elaborate high resolution CC scenarios. Application of statistical methods to analyze future climate change (2021-2050 and 2070-2099). In the past and future decades, numerous huge hydropower reservoirs have been / will be built in the Jinsha River Basin (JRB). In case those reservoirs will be operated properly, flood and drought events can be managed more effectively, and more social and economic benefit can be created. This research aims at developing a short-mid-long term hydro-meteorological forecasting model in the Jinsha River Basin, integrating the large reservoirs. During the last 2-3 decades, the southwest part of China has experienced increasing drought events, which caused significant economic losses. Additionally, the rapid socio-economic and demographic developments result in additional challenges with respect to water resources management. The research at hand presents a case study in Lijiang Municipality addressing the challenges of water resources management in each town of Lijiang. The Water Evaluation and Planning (WEAP) model was applied to evaluate and analyze the current water balance (2011-2015) and examine consequences of future developments (till 2030) on water demand. A combination of WEAP and the RS (Routing System) model is used to simulate rainfall-runoff as well as flow routing according to a semi-distributed conceptual scheme. These project highlights are elaborated in more detail in the JRB Project Booklet (available to download from the right-hand column). For more technical detail and supporting figures, see the JRB Project Factsheets (available to download from Further Resources). Hydro-meteorological characteristics under different climate conditions are recognized: The preliminary impact assessment of climate change on precipitation and runoff, based on historical and climate change data, contribute to a better understanding of the hydro-meteorological characteristics and future trends in JRB. The results could be a valuable reference for demonstrating climate change impact on socio-economic development to the public, and generate a vital basis for suitable adaptation measures. Hydro-meteorological forecasting model contributes to runoff prediction and flood prevention of the Yangtze River Commission (CWRC): A hydro-meteorological forecasting model at long, middle and short term has been built and calibrated for JRB region. It has been incorporated into the existing hydro-meteorological forecasting system of CWRC. The results can provide data reference and decision basis for CWRC to command flood prevention, and hence enhancing the capability on runoff prediction and flood prevention management of CWRC. The application of WWater Evaluation And Planning Model (WEAP) improved the level of comprehensive water resources management in Lijiang pilot region: A WEAP model was built and calibrated for Lijiang City. The water supply and consumption status in Lijiang was reproduced, which provides an important fundamental basis for the future water resources planning. Furthermore, CWRC plans to promote this model to Lijiang Water Resources Department by training local technicians. This shall lead to the application of this model in daily water supply and consumption management in Lijiang, and improves the level of comprehensive water resources management. Glacier monitoring capability in Yulong Snow Mountain has been improved: To improve detection capability of climate change, the enhanced monitoring equipment for Yulong Snow Mountain was designed and installed. Once the automatic glacier monitoring station is in operation, it can greatly reduce manual measurement workload and improve monitoring efficiency. Furthermore, it will be a vital tool for the research team to record glacier change. Assessment of the aquatic ecosystem in JRB has been completed: The composition, distribution and abundance of aquatic organism from Shigu to Yibin in JRB were evaluated and the endemic and protected fish resources and their important habitats were analysed. The heath of aquatic ecosystem in JRB was assessed by using the Fish Integrity Biological Index (F-IBI). The results indicate a strong need for ecosystem protection and restoration in the study region. Furthermore, habitat suitability curves of sensitive fish species were set up and a 2D-hydraulic model of fish habitat in a Jinsha river section near Panzhihua were built and calibrated. Comparison of hydro-meteorological models for climate change impact assessment has been conducted: Daily discharge calculated with two hydro-meteorological models – RS and VIC model - have been compared with measurements for the baseline period (1981 – 2010). It was shown that both models give good results for NASH / log NASH coefficient based on monthly data. However, the performance of RS model is better for daily data, especially in the Southern part of JRB (big study area). The same is true for results based on climate change scenarios for daily temperature and precipitation. Since reservoir management cannot be considered in VIC model, the Swiss and Chinese teams agreed to continue further impact assessment with RS model results. Chinese technicians and experts’ capabilities have been strengthened: Through multiple trainings in Switzerland and exchanges with Swiss experts in China, the Chinese team of over 40 experts and technicians from 6 involved departments strengthened their capabilities on different levels. They not only studied Swiss advanced working experiences, but also updated professional knowledge on risks of climate change, hydro-meteorological forecasting, integrated water resources management, glacier and remote sensing monitoring, aquatic ecology and fish habitat simulation, and adaptability countermeasures, expanding the horizon of water resources management. This promoted the improvement of Chinese project team’s overall capabilities and capacities. Switzerland and the People’s Republic of China have maintained bilateral relations since 1950, and have been cooperating for over ten years in the areas of water management, flood protection and climate change. In 2007, Switzerland and China signed a Memorandum of understanding (MoU) to intensify high-level political consultations and strengthen bilateral dialogues across a wide range of areas. In 2009 they formalized the cooperation and signed a MoU on water management and hazard prevention. Read "Integrated Water Management in Nicaragua: Rethinking Best Practice"